​Designed and built by Winkel Manufacturing, working calves will be easier with their new Winkel Calf Processor. Built for 300 pound or smaller weight animals, the Calf Processor is versatile enough to match up with most brands of calf cradles. equipped with entry and exit sliding gates.​..
set up for left or right side entry of the half circle. 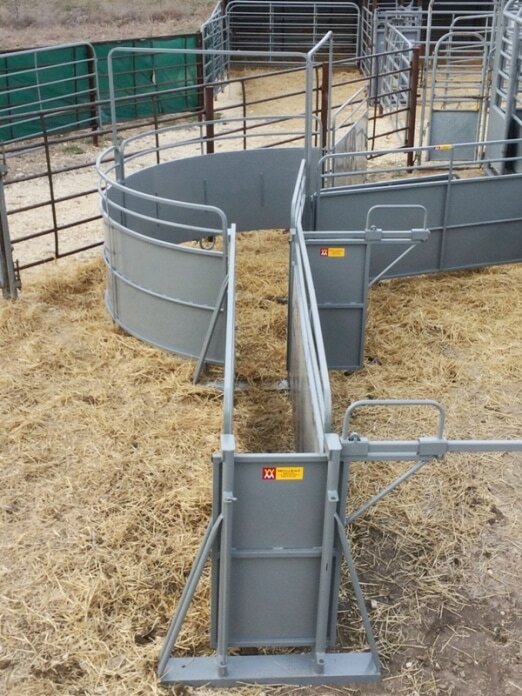 steel to improve the safe flow of calves. Operators can easily walk through the alley as there are no overheads. Slide gates on roller bearings allow for quick and smooth traffic control. The base on the sliders is 5" channel iron which gives stability with less chance of calves moving the unit around. Winkel Adapter Posts are available from the drop pen to the cattle panel hook-up. Page #s on site correspond to our catalog.